File Manager is an app created by Cheetah Mobile (whose official website is http://www.cmcm.com). File Manager has a rating of 4.4 on the Play Store, with 886461 votes. Similar apps are: SD File Manager (by MobilDev), Super File Manager (by OneGogo), MyFiles (by Monster Castle), File Manager + (by Flashlight + Clock), ASUS File Manager (by ZenUI, ASUS Computer Inc.), Clean File Manager (by Maple Media), File Selector/Explorer (by IO/Apps), X-plore File Manager (by Lonely Cat Games), Total Commander (by C. Ghisler), SHAREit - Connect and Transfer (by SHAREit Technologies Co.Ltd), Xender (by Xender Team), Clean Master (Cleaner) (by Cheetah Mobile). 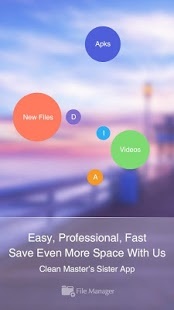 File Manager is currently available in the following countries: Peru, Switzerland, Romania, Israel, Turkey, Thailand, Germany, China, Japan, Denmark, Netherlands, Slovakia, Greece, Ukraine, United Arab Emirates, Poland, Estonia, Chile, Australia, Austria, Singapore, Indonesia, Czech Republic, South Korea, Colombia, Croatia, Serbia, France, United Kingdom, Sweden, Latvia, Lithuania, Norway, Finland, Hungary, Belgium, Hong Kong, Spain, Taiwan, Philippines, Malaysia, Russia, Bulgaria, India, Canada, Mexico, South Africa, Italy, Brazil, Portugal, Argentina, Saudi Arabia, United States, New Zealand, Egypt, Vietnam.